its regard for freedom of speech. In this perilous moment, let’s zoom in on Feb. 23, 1919, when 38 men and one woman sat in their tiny cells in the state penitentiary in Deer Lodge, sharing a common story. Each had been convicted of sedition for criticizing America’s participation in the war, and each was sentenced to hard labor for up to 20 years. It had been exactly one year since Gov. Sam Stewart had signed the law under which they were sentenced. Just the day before, two Slavic coal miners from Roundup had had their heads shaved, mug shots taken, and joined their doleful peers. The sedition law said that anyone who said or wrote anything in wartime that was “disloyal, profane, violent, scurrilous, contemptuous, slurring or abusive” about the United States was guilty. Sedition is the illegal promotion of resistance against the government, usually in speech or writing. What is illegal depends on the government and its regard for freedom of speech. The problem for the coal miners and their fellow inmates was that in the U.S. and in Montana in February 1919, freedom of speech was a nebulous right. The sedition prisoners in Deer Lodge probably knew nothing of this. All they knew was that juries, seizing on the vague language of the law (what exactly is “disloyal” or “scurrilous”?) and acting in the temper of the times, had quickly convicted them, and that judges had thrown the book at them. • Josef Hocevar, one of those miners, originally from Slovenia, at the Roadside Saloon: “I am an Austrian. This government is no good. I have been a citizen of this country since 1888. I am not a pro-German, I am an Austrian. President Wilson had no business getting into this war.” (and then he threw a few F-bombs). Six to 12 years. • Fay Rumsey, a Michigan native who homesteaded in Sarpy Creek south of Hysham with his wife and 12 kids, beset by horse rustlers, said “that he wished the Germans would come in and clean up the U.S. and especially Sarpy Creek...” Two to four years. • Earnest V. Starr, an Ohio native who homesteaded near Hardin, refused to kiss the flag when confronted by men at the general store pressuring him to buy Liberty Bonds. “What is this thing anyway?” he asked. “Nothing but a piece of cotton with a little paint on it, and some other marks in the corner there. I will not kiss that thing. It might be covered with microbes.” Ten to 20 years plus a $500 fine (about $9,000 today). • Thomas Burans, an Irishman farming on the Flathead reservation, told a young draft registrant in front of the Montana pool hall in Ronan, “Get out of the country and the jurisdiction of the draft board. Don’t enlist. They are only tin soldiers anyway, and they are persecuting the I.W.W. [Industrial Workers of the World].” Found guilty by a jury that included the Rev. John Maclean, the father in Norman Maclean’s A River Runs Through It. One to two years. The average age of those sent to prison for sedition was 45. The oldest was 74 and the youngest was 29. All were paroled by 1923, after wartime passions had subsided, but collectively, 65 years of their lives were wasted in prison. Nineteen men each received fines of up to $20,000, which is worth about $360,000 today. We also know how imprisonment devastated them. After Rumsey’s conviction, his wife could not hold on to the homestead and it was foreclosed on for a few hundred dollars. Most of the children went to orphanages or were “let out” to other people. One daughter in an orphanage, operated on for an infected toenail, died of sepsis. Rumsey’s descendants did not begin to find each other until the late 1990s. How had patriotism become fanaticism? A well-meaning but misguided effort to rouse a populace indifferent to the war, after President Wilson declared hostilities against Germany in 1917, careened tragically out of control. A federal propaganda agency called the Committee on Public Information enlisted writers, artists, educators, speakers, journalists and every medium at its disposal to fuse the American people into “one white-hot mass,” in the words of CPI director George Creel. But the government also demonized the enemy and those suspected of sympathizing with it. As a result, those who exulted in being part of the great and selfless enterprise of righteous war eagerly repressed individuals and minority groups who didn’t subscribe to the same values. In the malign stress of wartime, a thousand ardent fingers wove a stifling blanket of uniform thought and opinion across America. In this atmosphere of fear and suspicion, hysterical rumors flew like bats from a cave. Residents of the Bitterroot swore they saw German airships overhead and German wireless stations deep in the forests. Poisoned beans were being imported in a “diabolical plot to murder Americans,” the Helena Independent reported. German agents armed with toxic bee pollen were fixing to destroy Montana’s wheat crop, the Daily Missoulian announced. As risible as these rumors were, the hysteria that spawned them also lubricated the machinations of industrial firms like the Anaconda Copper Mining Company, eager to squelch dissidents and labor activists such as the anti-capitalist I.W.W. The Wobblies were a pesky, in-your-face movement whose attacks on working conditions and low wages and instigation of strikes began to threaten the Anaconda’s huge war profits. Tying troublemakers to the German enemy proved remarkably easy, despite any proof. Rumors and innuendos were enough. And thus was born Montana’s sedition law, on a snowy February in 1918 in a special session of the state legislature. It ran its course in just more than a year. Hundreds were arrested; 79 were convicted. 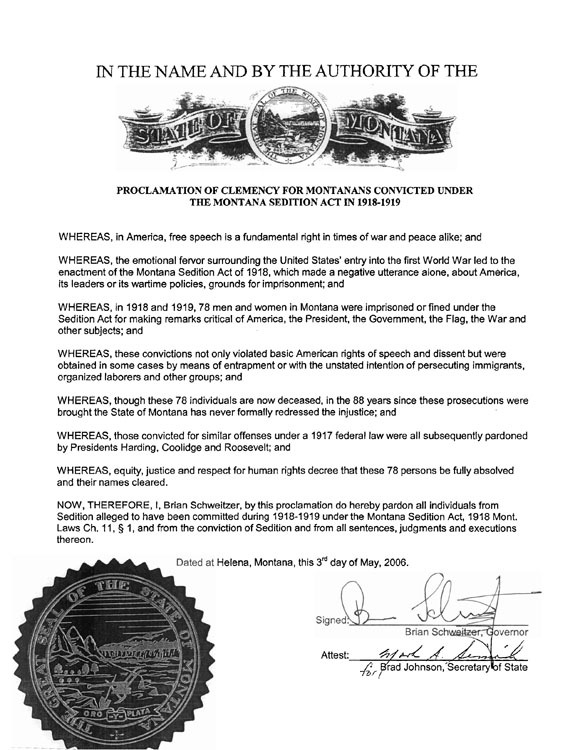 The Montana law’s federal counterpart, a section of the Espionage Act, was strengthened by an amendment that copied Montana’s law almost word for word. Under the federal law, more than 1,500 dissidents, including Socialist presidential candidate Eugene Debs, were imprisoned. Debs’ appeal to the Supreme Court was denied, as were others’, but growing doubts by Justices Oliver Wendell Holmes Jr. and Louis D. Brandeis eventually led to a much more robust interpretation of the First Amendment, giving more breathing room for dissent. But that more enlightened thinking was far too late for the Montana sedition prisoners and their national counterparts. In 2006, however, law and journalism students at the University of Montana, guided by law professor Jeff Renz and me, and motivated to action by the horrific unfairness of the convictions, successfully petitioned Gov. Brian Schweitzer to posthumously pardon the ex-convicts. Descendants gathered from across the country in the Capitol Rotunda on May 3, 2006, to gain closure as the governor signed each individual petition and said “I’m sorry” to each relative. With this act of redemption and redress, the governor liberated them and their descendants, and all of us, from the shame of their unjust convictions.